Washington CT is a leaf-peepers paradise – perhaps home to some of the best fall foliage vistas in Connecticut. Starting in late September, the town’s abundant greenery slowly begins to change color and bright oranges, reds, and yellows fill the surrounding landscapes. It is truly a breathtaking scene when Washington reaches its peak foliage season in mid to late October. At an elevation of 776 feet, The Steep Rock Summit provides visitors with a breathtaking view of the Shepaug River Valley. In the fall, this valley turns into a tapestry of beautiful colors that illuminate the surrounding hillsides as well as the waters of the Shepaug. The colors that blanket the forested hills around Lake Waramaug are quite magnificent during the fall. Take in the picturesque views from around the lake, or bring your kayak to experience the wrap-around fall splendor. For spectacular views of the foliage around Lake Waramaug, be sure to view the lake from above. Drive along East Shore Road (Route 45) towards Tanner Hill Road. To your left, you will be able to see the foliage that outlines the Lake and to your right, you will encounter the bright colors of the surrounding hillside. As you follow along Meeker Trail in the Macricostas Preserve, you will come upon The Lookout, which is a resting spot with a scenic view of the surrounding countryside. In the fall, The Lookout provides visitors with a resplendent view of the foliage as well as the fields that lie adjacent to Meeker Swamp. Take a drive along one of the scenic roads that runs through Washington Depot. Beautiful foliage can be found anywhere you look and the colorful leaves mix perfectly with the green of the surrounding farmland. With an elevation of 820 feet, The Pinnacle Summit offers panoramic views of the breathtaking foliage in the Hidden Valley Preserve. As soon as you step foot on this summit, you will be hit by the beautiful colors of the forested hills of the valley. As you trek through the Hidden Valley Preserve, be sure to venture across the Henry David Thoreau Footbridge. From either side of this bridge, you will be able to see the spectacular foliage that brightens the Shepaug River. The drive along route 202 in Marbledale presents open views of the surrounding foliage as well as the pastoral farmland that dots the landscape. The views from the top of Mt. Tom Tower offer the ultimate foliage vantage point. At 34 feet tall, the tower provides visitors with beautiful vistas of the neighboring hillsides as well as the foliage around Mt. Tom Pond. 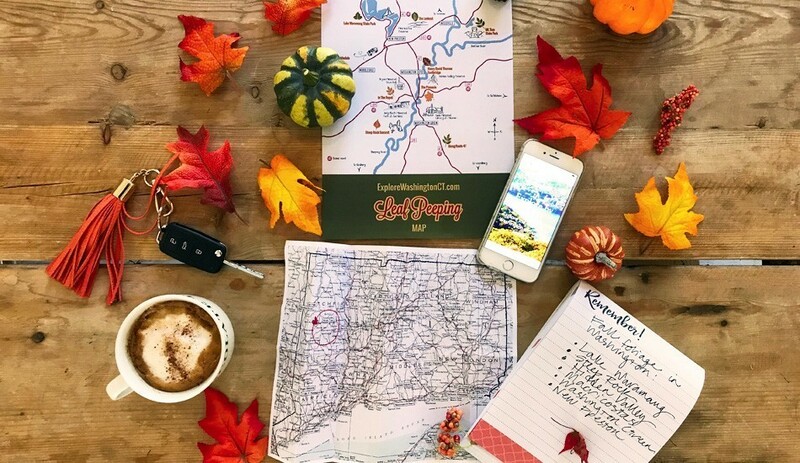 Looking to stay in Washington for a weekend or planning a day trip this the fall? Check out our Fall in Washington Itinerary for ideas of what to do while you are in town.